If you’re trying to find a movie that’s worth your $11 at the local cineplex, the App Store has plenty of apps that help you track down what’s playing and when. (We’ve reviewed a pair in Showtimes and Movies.) If you’d rather just stay in and watch TV, the App Store has you covered there, too—programs such as TV Forecast and What’s On? offer TV listings in the palm of your hand. Turn On, Tune In: i.TV presents you TV listings with channels reflecting your cable provider or satellite service. Tap the top of the screen to jump to different times and sorting options. But what if you want to know about both the movie and TV options available to you and you don’t care to jump back and forth among apps? i.TV offers you a one-stop app for all the latest listings, up-to-date and searchable by everything from genre to channel and more. It may be the only entertainment app you’ll need to carry with you on your iPhone or iPod touch. The recent 1.2 update to i.TV added a What’s Hot tab to the TV, Movies, and My Media buttons on the bottom of the screen. What’s Hot features entertainment news, TV show recaps, and previews of upcoming TV programs and movies. You can’t customize this information. The What’s Hot tab also knocked i.TV’s excellent Search tab off the main page and on to the More screen, which is unfortunate. Still, you’ll spend most of your time with this app in the TV, Movies, and My Media tabs because that’s where i.TV’s power really lies. Tap the TV tab and you’ll get a list of the show currently airing in your area. (You can set up i.TV to grab the listings of your cable provider or satellite service.) If you want to search for future programs, tapping the top of the screen takes you to a Display Options screen where you can search by time, jump to prime time listings, or sort listings by genre, category, title, ratings, and more. One Thumbs Up: Tapping the thumb in the upper right corner of the screen designates a movie theater as one of your favorites and stores it in the My Media section for easy access. 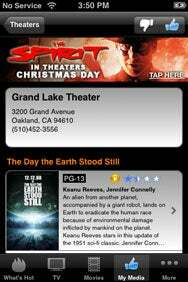 The Movies tab lists upcoming movies, current releases, and local theaters selected by using the location capabilities of the iPhone and iPod touch. However, once you’ve selected a theater, you can tap a thumb’s up icon to store it on the My Media tab—this lets you easily see what’s playing at the cineplex near your house, even if you’re still at work. In addition to favorite theaters, My Media also stores your favorite TV shows, movies, channels, and actors. It’s here that you can also manage your Netflix queue. Netflix users get access to more than 100,000 DVD titles. You can add or delete titles from your queue. Even better you can instantly stream content to your Intel-based Mac via the Netflix instant-watching queue. The app boasts plenty of other niceties and features. Want to watch Nova next Sunday at 9 on PBS? Find it in the listings, and i.TV can e-mail you a reminder. Load the attached .ics file into you desktop calendar and you’ll get a reminder the day the show airs. Taking this concept a step further, broadband-connected TiVo owners can now select programs to record remotely from the 1.2 version of i.TV. Besides being a great resource for finding what’s on TV, users can also watch movie trailers and TV previews on your iPhone or iPod Touch as well as a limited (though expanding) selection of full-length television shows. If you’re the type that prefers to catch your movies in the theater, i.TV not only finds theaters and movie times based on your location but now lets you buy tickets in advance. i.TV has its share of flaws. Some users will object to the ad that appears after the splash screen, adding to the program’s launch time. (Still, even free applications like i.TV have their cost.) The app also has a reputation for bugginess, though the 1.2 update seems to have fixed a lot of the common problems. i.TV is a feature packed app that is a must-have for any movie or TV buff with an iPod Touch or an iPhone. Once you see all that it has to offer, you’ll be scratching your head wondering how it could be free. i.TV is compatible with any iPhone or iPod touch running the iPhone 2.1 software update.